Miley Cyrus fans are losing it big time after the star uploaded a birthday snap it which is looks like she could possibly be pregnant. The singer turns 25 today, and shared her excitement with her followers by posing under balloons which spelt out her name. But it was the cradling of the stomach which she attempted to conceal in an over-sized T-shirt that's got fans convinced she's got a little bun in the oven. "So close to b-day time! Stoked for a day full of Tofurkey & loved ones! Ain't it ironic? #VeganTurkeyBaby," she teased of the gorging that lay ahead. But did her caption have a double meaning? Her followers certainly thought so. "Are you pregnant?" asked several, while another wrote, "Yup, I definitely see a baby bump! Pregnancy announcement?" 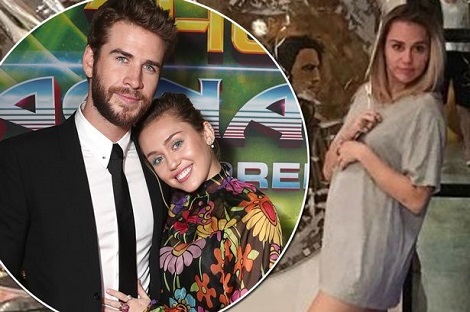 One spotted her boyfriend Liam Hemsworth's reflection in the mirror as he took the pic, and just couldn't even. "OMFG MY HEART" she wrote.